When I cracked open the front cover of this book, I didn’t even know what shamanic astrology was. I didn’t even know spirit animal signs were a thing. So that’s where I’m coming from as a book reviewer– not a place of knowledge or expertise, but the place of a beginner and how this book might serve the beginner. Shamanic Astrology: Understanding Your Spirit Animal Sign by Lucy Harmer (North Atlantic Books, 2009) introduces the twelve spirit animal signs of the Native American medicine wheel and how these animal signs correspond with our date of birth. Prominent public figures in the metaphysical community, such as Judy Hall (The Crystal Bible) and astrologers Derek and Julia Parker, Dr. Steven Farmer (Earth Magic and Animal Spirit Guides), Vicki Noble, creator of the Motherpeace Tarot, and so many more have thrown their positive weight toward Shamanic Astrology to give their endorsements. The book is delightfully comprehensive. An introductory chapter acquaints you with shamanic astrology, the medicine wheel, and both the solar and lunar cycles. Then Harmer dives into the background of how spirit animals are interpreted, i.e., seasons, cycles, winds and directions, elements and clans, metaphysical correspondences, life paths, etc. Each of the twelve animal signs are covered, starting with a profile chart, description of personality, key metaphysical correspondences and influences, and then general insights into that sign’s luck– career, money, health, and then love. In the love section, compatibility with the other animal signs is provided. Shamanic Astrology closes with advanced material on the medicine wheel and the lunar calendars. Now let’s take a look at the twelve spirit animal signs. 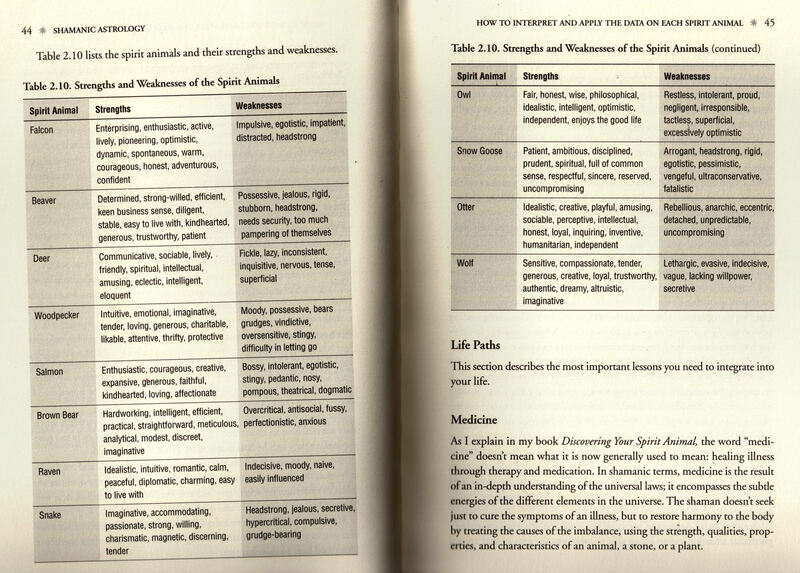 Later in this review, check out Table 2.10 from Shamanic Astrology, which outlines the strengths and weaknesses of the twelve spirit animals. 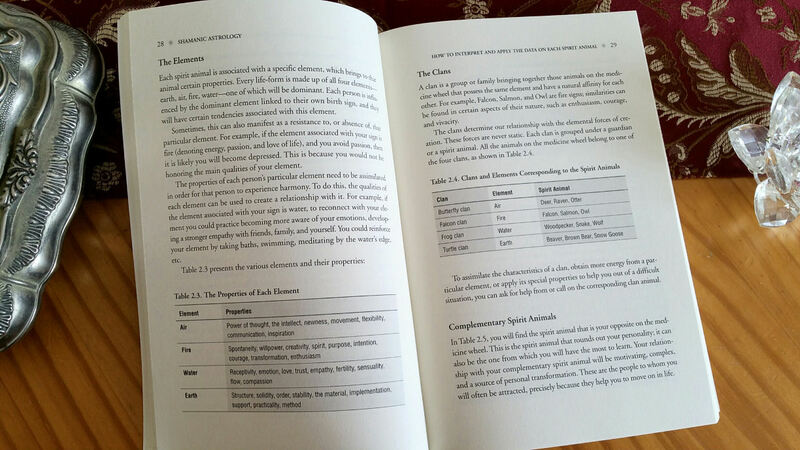 Table 1.1 from Shamanic Astrology. Click image for closer viewing. Since I was born in the northern hemisphere, I am a raven. Hubby is a snow goose. I’ll use these two animal spirit signs to illustrate how much information you get from this book. The raven corresponds with the west direction, the butterfly clan, the element Air, azurite gemstone, and the color blue, among many other correspondences that the book provides. Ravens are idealistic, romantic, and diplomatic. These echo common characteristics attributed to the Libra. The Pueblo tribes associate the raven with the magical arts and the raven relates to the power to move between mystical realms. Cool! I am the guardian of magical ceremonies! Woohoo. A raven relates to the month of the dead leaves, when the turn is inward, and so there is a sense of introversion about the raven, in contrast to the extroversion often associated with the Libra. As a raven, azurite will help me facilitate out-of-body journeys and the development of my intuition. 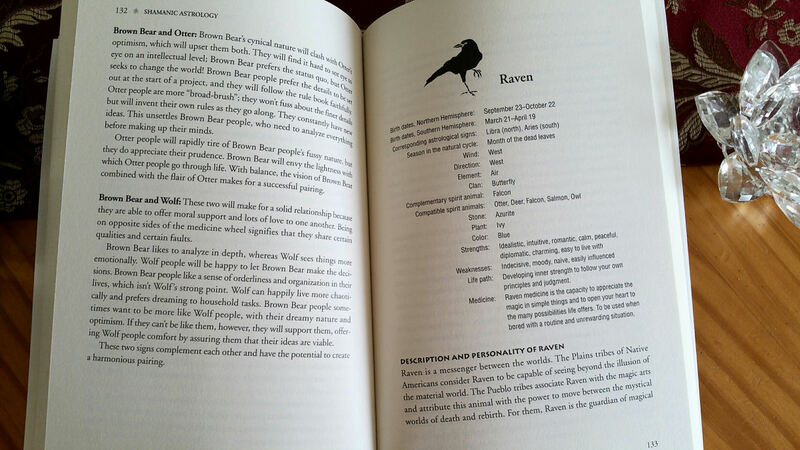 In terms of career prospects for the raven, ravens earn a good salary but aren’t particularly ambitious, according to the book. They also gravitate toward luxury and comfort. Our weakest parts of the body are the kidneys, skin, and balance mechanism. As for love compatibility, let’s check out the raven and the snow goose, since I married a snow goose. Doh. I’m too superficial and light-hearted for the snow goose. If we want this relationship to work, we’ll have a lot to learn from each other. Now for the snow goose. The snow goose corresponds with north directionality, the element earth, the crystal quartz, and the color white. The snow goose’s medicine is the capacity to wait for the right moment to take action. They know how to be at the right place at the right time. *nod* That definitely sounds like Hubby. The snow goose is all about raising the spiritual consciousness and yet maintaining traditional values and ancestral heritage. The snow goose is drawn to tradition. These individuals are determined, stable, ambitious, disciplined, and wise. They possess a hidden talent for storytelling. The snow goose is the guardian of wisdom. In terms of career prospects, the snow goose gravitates toward conventional careers that will bring them status and power. They can be insecure when it comes to money matters and in terms of health, they tend to be weak in the bones, knees, and the absorption of minerals. In the love compatibility section for the snow goose, the entry for snow goose and raven appears to be a word-for-word repeat of the raven and snow goose entry for the raven. 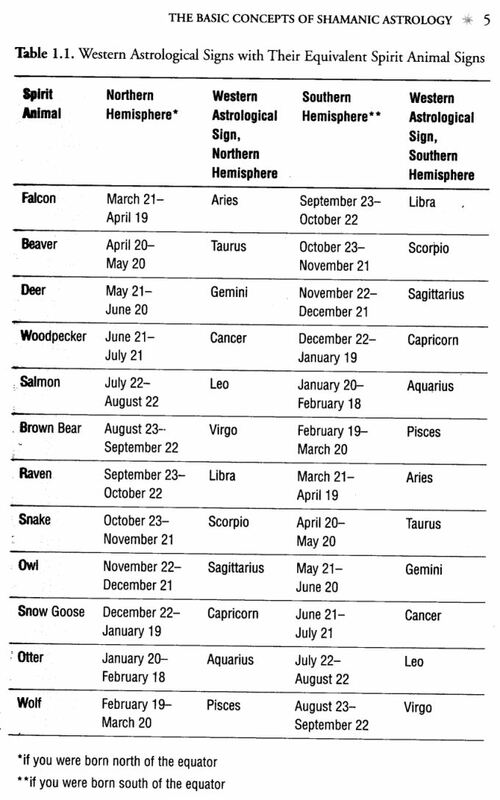 Scan of Table 2.10 from Shamanic Astrology. Click image for closer viewing. 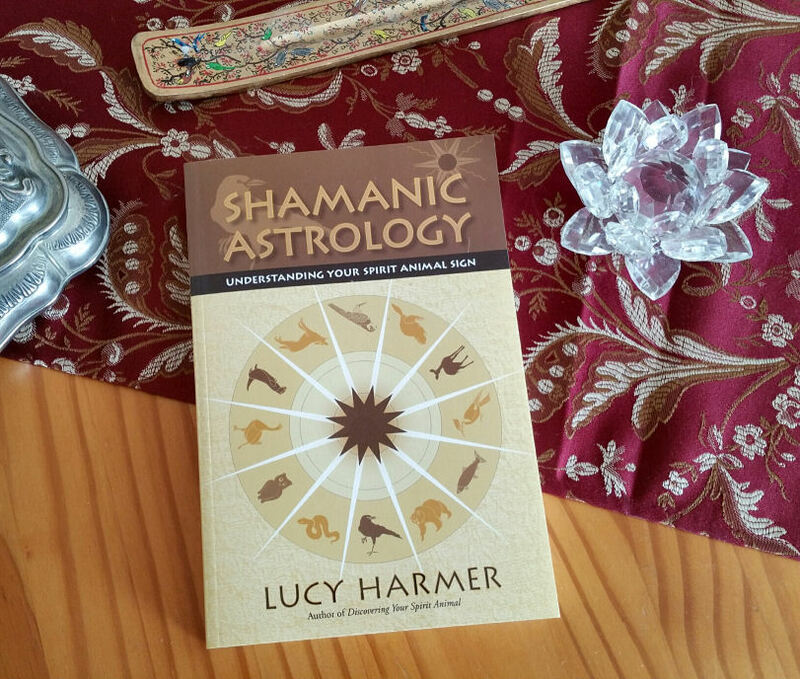 Lucy Harmer’s Shamanic Astrology is the preeminent primer text and handbook to have on the subject. Outstanding in scope yet packaged and presented in a digestible manner. For me, it’s a fantastic supplemental guide to my current astrology practice. FTC Disclosure: In accordance with Title 16 of the U.S. Code of Federal Regulations Part 255, “Guides Concerning Use of Endorsements and Testimonials in Advertising,” I received the book Shamanic Astrology from the publisher, North Atlantic Books, for prospective review. Everything I’ve said here is sincere and accurately reflects my opinion of the deck and book set.